It’s an exciting time for Barcaldine Castle. To add to our Scottish Breakfast and Afternoon Tea options, we have introduced our Black Castle Restaurant this year! To launch this new service, our chef John Larkins has created a beautiful menu using fresh, high-quality ingredients. John has put his extensive experience with European food to good use, as reflected in his selection of delicious starters, mains and desserts. Many of the choices are traditional Scottish dishes (perfect for us), while some have roots in other places. How could we not include this? It’s a national favourite — or the national favourite! Despite what some may think, haggis is not an animal. It is the heart, liver and lungs (minced) of a sheep, mixed with onion, oatmeal, suet and spices. Although it’s unclear where haggis originally comes from, it’s still the national dish of Scotland, and very commonly associated with the Scots. 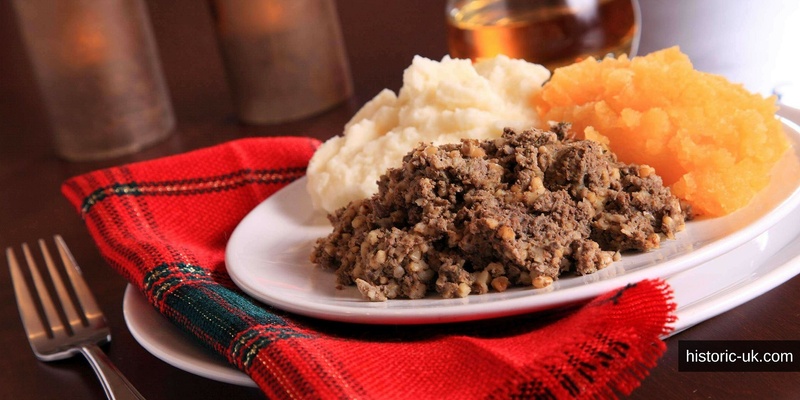 It is also the main course of a Burns Supper since Robert Burns’ poem Address to a Haggis in 1787. In Burns’ own words, it’s the “great chieftain o’ the pudding-race”! Here at Barcaldine, our haggis comes as a starter with “neaps and tatties” (turnips and potatoes) and a whisky cream sauce. Mmmmm! 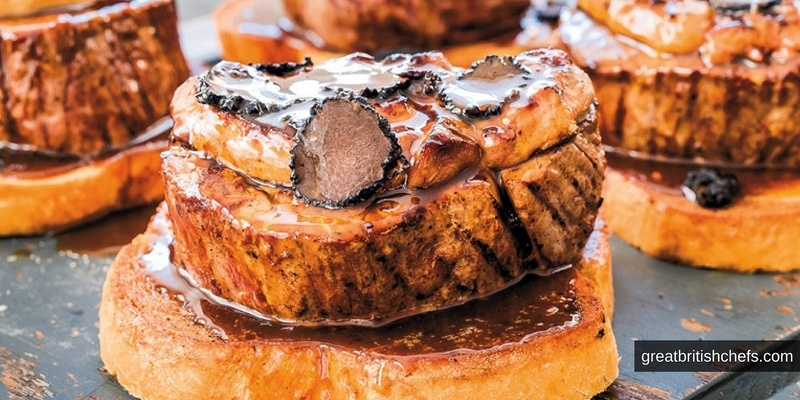 A highlight of our mains is our Tournedos Rossini. A beef fillet steak on a crouton with homemade pâté, this French dish is named after the Italian opera composer Gioacchino Rossini. Rossini loved good food and lived in Bologna, Florence and Paris. The gourmet chef of one of his favourite restaurants in Paris, Casimir Moisson, is one of those believed to have invented the dish in Rossini’s honour. One day, Stéphanie had simply been making an apple pie, when she accidentally overcooked the apples in butter and sugar, and they became caramelised. 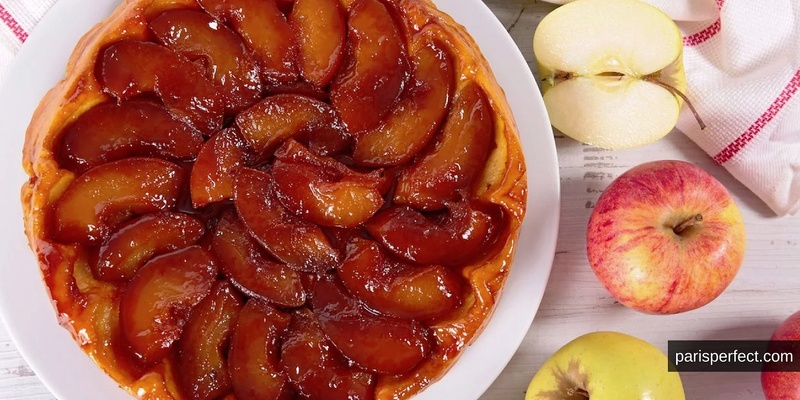 Not wanting to waste them, Stéphanie put her pastry base on top of the apples and put the whole pan in the oven. In the end, her guests really enjoyed the rescued tart, and word of it travelled all the way to Paris. Our menu is now available for you to peruse. And we have even more delicious dishes for you to try. Have a look at our varied selection of European food (mainly Scottish, of course) and see what takes your fancy! If you follow our blog or social media or if you’ve treated yourself to a stay at our luxury castle you’ll know that we have you spoilt for choice in the food department – offering delightful Afternoon Tea sessions, and hearty Scottish breakfasts (or lighter alternatives, including a Gluten Free menu) to keep guests going throughout the day. However, we are pleased to announce that we’ll soon be expanding our food services to offer a full à la carte evening menu for guests and visitors alike to feast on! And how are we able to offer this exciting (and tasty!) new addition to our services, we hear you ask? We’re thrilled to announce experienced and talented chef John Larkins (pictured) will be joining our team full-time after previously dazzling our wedding and exclusive use clients! A Scottish native himself, John has been perfecting his culinary skills since leaving school, having accumulated a wealth of cooking experience by working with French, Scottish, Italian and Spanish chefs throughout his career to date. As his cooking career has gone from strength to strength, John has adopted his own unique and special culinary style whilst sticking to the fundamental laws of cooking. His infectious passion for creating delectable dishes has seen him work the way up to Head Chef positions so we know our diners’ taste buds are in safe hands! “Taste, natural colours and texture are so important; therefore, it is vital to use local and in-season produce and build a menu around those types of ingredients, whilst keeping your menu choice limited and changeable,” John explains. “I love presentation and design, it is so important to marry aesthetics with beautiful food,” he adds. Sharing his motivations for creating delicious plates, John says: “knowing you have created and presented a symphony of joy in your restaurant where your customers obtain an unforgettable and amazing dining experience brings true satisfaction, which is always my aim. And when he’s not cooking up the ultimate dining experience for our guests and visitors? “It’s true I have a great passion for food but during my free time I love my golf”, John admits. “My other interests are singing, garden design and sunshine holidays (especially Crete in Greece).” – we don’t blame him! “Daniel and I are super excited to have John join our team. We already know that his food exceeds expectations and he has the amazing ability to transform even the simplest of dishes. “The feedback we have received over time has been phenomenal and we always knew that he could easily become part of our Barcaldine family and help us grow the business in an exciting way. Castles by their very nature hold mysteries and, as one of the only ancient castles on the mainland open on a B&B basis, our very own Barcaldine Castle is bound to have some shadowy secrets of its own. With a friendly and memorable accommodation service – it would almost be a crime not to stay and discover the thrills of the 400-year-old castle! According to a public survey conducted in 2013, many visitors to the castle believe it to be haunted – possibly by the ghost of Donald Campbell, Laird of Barcaldine, since he was violently murdered in the castle in the 17th century by Stewart of Appin during the Massacre of Glencoe, one of the most notorious massacres in Scotland’s rich and colourful past. Victim Donald is the brother of the castle’s founder Sir Duncan Campbell, who built the ‘Black Castle’ between 1601 and 1609. Legend states that murdered Donald continued to haunt his brother Sir Duncan, as punishment for sheltering Stewart of Appin, his murderer, at his home in Inverawe, where Appin had fled after murdering Donald. Poor Sir Duncan didn’t even know his brother had passed away, so unbeknownst to him sheltered his brother’s killer. By the time he had wised up, it was too late, the murderous Stewart of Appin had fled once again! Donald Campbell reportedly haunts Barcaldine Castle out of pure frustration at the injustice he suffered. Guests often tell tales of The Caithness Room being haunted, with sightings of Donald’s ghost featuring heavily in their stories. Many who have slept on the right side of the king-sized bed in The Caithness Room claim that they experienced feeling pressure on their back or legs as though someone was sitting on them! Others allege that odd lights have moved around the room at night, with no clear explanation as to how they got there. The TripAdvisor survey may have been carried out in 2013, but many are still tempted to find out if Campbell’s ghost still roams the rooms and halls – are you?! The castle may have wi-fi access and modern facilities but rooms such as The Breadalbane Room retain their traditional charm, boasting a super king-sized four-poster bed commissioned in 1898. Meanwhile, The Lochnell Room features an impressive 17th century Jacobean four poster double bed that is complemented by other period furniture. Ornate, open roaring fireplaces, antique furnishings and paintings and even a secret staircase ensure the historic feel of Barcaldine isn’t just restricted to the bedrooms but embodies the entirety of the castle! With secret spiralling staircases, a sinister bottle dungeon and being nestled in the stunning mountains of Glencoe boasting picturesque views, Argyll’s Black Castle is now available to be used as a backdrop for film and TV shows as of 2018. If you’re a movie fan, why not visit the castle to say you’ve been to what will no doubt promise to be an iconic film location in years to come? Whether you’re a ghost hunter, film and TV fan or history buff, we’d be surprised if you weren’t intrigued by what Barcaldine Castle has to offer. To book your stay visit our Reservations page. For more reviews from our guests visit TripAdvisor.